This lovely, 46m2 apartment is equally as ideal for business trips as for holidays with the family or friends. Its brilliant location, right in the heart of Paris' 14th arrondissement, will enable you to explore the charm of the French capital, as well as of this typically Parisian neighbourhood. 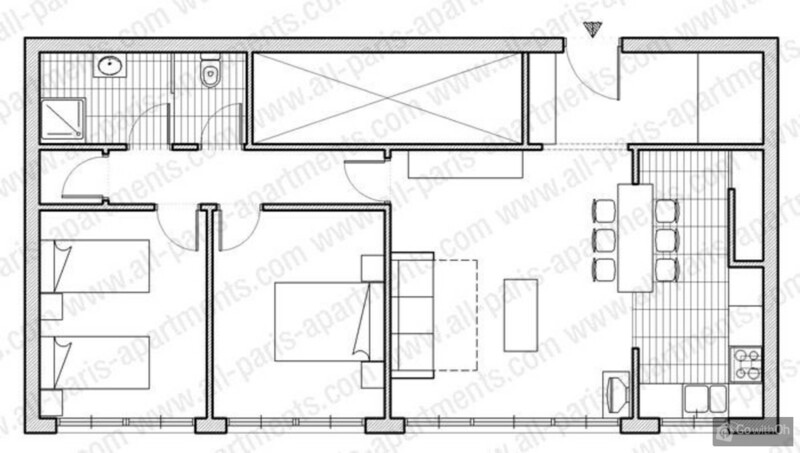 The apartment, which has an area of 60m2, can comfortably accommodate a maximum of 6 people. 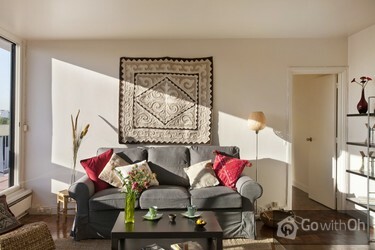 Tastefully-decorated, this beautiful and extremely charming flat is equally very sunny and quiet. It is located on the 8th floor of a magnificent building in a very tranquil street, and each bedroom has its own large French windows which lead onto the terrace which runs along the length of the apartment. 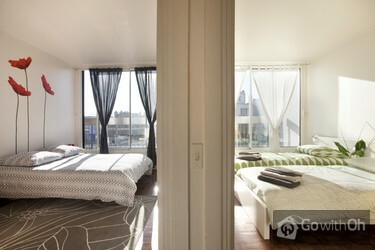 Its two beautiful bedrooms have, respectively, a double bed and two twin beds. The spacious living-room has a sofa-bed for two people, a flat-screen TV, DVD player and WIFI connection, which are at your full disposal for either work or leisure purposes. The bathroom, which is large and pretty (with a separate toilet) has a shower and is ideal for relaxing in after a long day walking and exploring the streets of Paris. You will find yourself in an extremely calm and pleasant neighbourhood, which is well-linked to public transportation. Within the immediate vicinity, you will have no problems funding a number of shops, bars and restaurants, within the streets around the apartment. You will be well located for accessing Paris' two airports. De Denfert-Rochereau is just 3 minutes walk, and from there you will be able to use the RER line B to the Airport Charles de Gaulle. By taking the 'Orly' bus, you can get to Orly South and West in just 25 minutes. That same line B on the RER will also take you directly to the Jardins de Luxembourg, the Latin Quarter, Notre Dame, or the effervescent neighbourhood of Les Halles. You will also be able to use two metro lines from Denfert-Rochereau (lines 6 and 4). Line 6 will take you to the Champs de Mars and the Eiffel Tower, Place de lEtoile, Arc de Triomphe and the Champs Elysées, whereas line 4 connects with Montparnasse, Saint Germain and to the heart of the Quartier Latin, Saint Michel and the Odéon. Châtelet les Halles, the fashionable culture hot-spot of the city is also easily accesible thanks to this same metro line, as well as the artistic, bohemian and party area of la butte de Montmartre, where you will find the Basilica of the Sacré Coeur (Metro Barbès Rochechouart or Château Rouge). Option of a second set of keys with an extra deposit of 50. There is a second cot available to be requested before the arrival. the accomodation was well equiped and neatly decorated, and, though close to the centre, in a quiet neighbourhood. 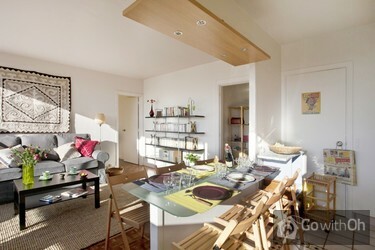 proximity to the metro was highly convenient, easy access to paris. shops (supermarket boulangerie for fresh croisants) literally around the corner. The accommodation was really spacious and warm in the winter. The landlady didn't speak any English which made communicating rather difficult but she was very hospitable and lovely. Location was ok. Bit far out of Paris but the metro is very close. Die Kontaktperson war sehr freundlich, hatte jedoch zu unserem Erstaunen angekündigt, 20-30 EUR für die Endreinigung von der Kaution einbehalten zu wollen und musste erst darauf hingewiesen werden, dass die Endreinigung im Preis inbegriffen ist. Leider gab es auch auf Nachfrage hin keine Quittung ...für den gezahlten Bargeldbetrag. Die Wohnung liegt verkehrsgünstig und ist recht ruhig, leider hört man aber auch nachts die RER-Linie, die ganz in der Nähe vorbei fährt. Die Betten sind schön fest, der Balkon bietet bei passenden Temperaturen auch Platz zum Sitzen. Angenehm ist auch die seperate Toilette. Im Badbereich ist ausreichend Platz für eine Person, der Wasserdruck und die Bedienung der Dusche sind gut. Auch ist eine größere Zahl Handtücher in verschiedenen Größen vorhanden. 4,5 Appartement agréable, bien conditionné, au calme et bien situé (bus, métro, commerces ... ) Personne de contact avenante et très serviable . Beautifully appointed, great building. Basically there was nothing that we needed that wasn't in the apartment. An extra key would be handy though, as without the codesone person on their own can get stuck outside. Good beds! En everything we needed for a short stay in Paris. Nice contact with the owner by mail. Very willing to help us even when we changed plans the day before arrival. Excellent apartment in a nice neighborhood. Apartment neat and clean. Easily accessible. Metro in walking distance. Supermarket in a 5 minutes walk. Handy for children: large park within walking distance. Contact beforehand was good, fast and informative. The "landlady" was friendly. In short: fantastic base for a visit to Paris! 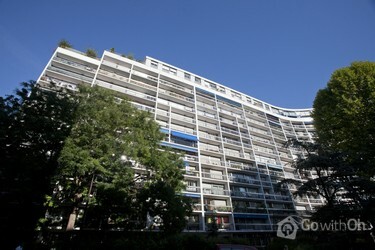 Well appointed, light and airy apartment in a quiet area, with all the necessary amenities close by and within a pleasant stroll of St Germain. die wohnung war sauber,ausreichend für sechs personen ausgestattet , der beschreibung voll entsprechend. durch unseren verspäteten flug kamen wir erst um 1 uhr nachts an , was aber für die hausmeisterin kein problem war und sie uns trotzdem freundlich empfangen hat. einziges manko ; auf dem balkon könnten sich einige liegen befinden. All-Paris-Apartments y el proprietario tienen que estar avisados del número exacto de inquilinos antes de la llegada para preparar correctamente el piso. El piso dispone de un armario en la habitación con 2 camas individuales. La otra habitación dispone de una cómoda. Wohnung war sehr schön, hell (große Fenster) und freundlich eingerichtet. Umgebung ruhig, aber alles um die Ecke, was man braucht. Lediglich in WC und Bad bröckelt der Putz etwas, was wir aber mit französischer Lässigkeit glatt übersehen. Ideal für Familien, wer mehr Nachtleben sucht, sollte ...besser ein anderes Viertel wählen. Uns hat die Wohnung sehr gefallen, jederzeit wieder! We enjoyed the stay there. The apartment had all we needed. The concierge was very helpful. The apartment was close to many pastry shops and the metro and the Oz pub. We walked from there to the main part of Paris through the lovely Gardin du Luxembourg. The screens outside the windows made for a wonderful sleep. Hemos estado muy a gusto. Bonito, limpio, luminoso, amplio, tranquilo y bien comunicado. 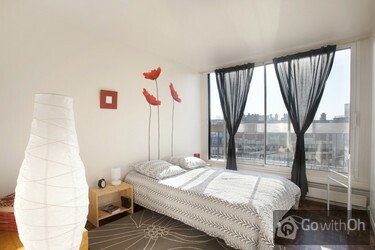 A wonderfully comfortable appartment in a choice location. A small local supermarket was just a few feet away, and the metro station about 1/4 mile. Also withing walking distance are very pleasant restaurants and a variety of local shops including patisserie. Appt. had all amenities including ...washing machine. Only suggestion would be to provide more clothing storage for the bedrooms, as we had to live out of the suitcases; but this is relatively minor! 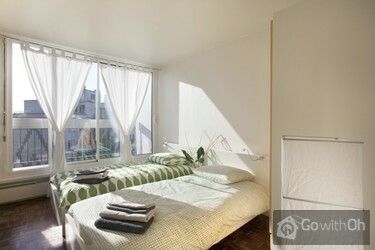 Would recommend to anyone wanting a comfortable stay in Paris in a modern appt block. Very prompt in responding over email. Booking was very easy, but would have liked to have been able to pay balance to you as well in order to avoid having to carry a large amount of cash for the balance. Would certainly recommend using your service to others. Not enough storage space for clothes but excellent kitchen. 1. We chose this because of its proximity to RER. Very convenient to get to Versailles and CDG airport. Also to other sites in Paris, and we love the district. Discovered rue Couedic with that connects with rue General Leclerc, which leads to the pedestrian open market, rue Daguerre. So location is ...perfect for those who do not wish to be in the city center. We did not know beforehand that there is a Velib (bike rental) right outside the apartment - it would have been very nice to bike to Montsouris! 2. 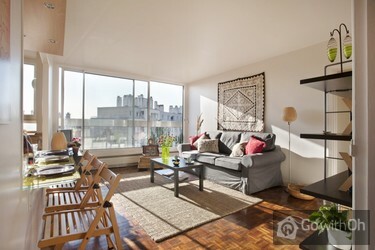 The good things about the apartment: plenty of natural light, and because our visit was in the fall, this is a plus. In the summer, without AC, even with the shutters, it may get warm. 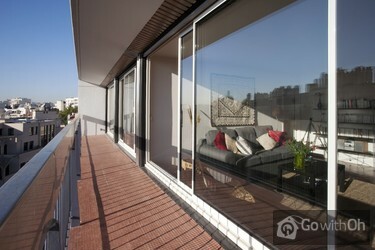 We love the sliding doors that open to a long balcony. Those with small children, though, beware. Plenty of towels and nicely decorated. 3. Now the downside: the website promised WiFi, and this is a crucial factor in our decision making. This, nor the telephone line (not mentioned in the website, but written on a piece of paper to welcome guests), was working. We arrived late after a long journey, and had relied on internet for several things including Skype. Of course without any connection, we could not even complain to the owner. Later we found out that the TV is not working properly (bad audio) and the CD player is erratic. Minor details but show that the owner does not give attention to these. 2. Others have mentioned the inconvenience of being provided with only 1 key, especially since we are 2 couples with different itineraries, and having no way to communicate from or to the apartment, this makes our experience less satisfactory. 3. Other minor disappointing things: instruction (provided in several languages, nice!) is rather sparse. I speak very little French, so unfortunately, as mentioned by several reviewers already, you are out of luck communicating with L. She is very polite and lovely, so I feel bad complaining about her. Therefore a more thorough welcome in the written form would be very helpful. 4. I asked her for an extra key (she checked her binder and said it was not mentioned in the contract). There are numerous knick knacks and random stuff filling the closet space, and one bedroom has no closet at all. It gives the impression that the owner never bothers to organize his belongings and uses the apartment for storage, not a nice feeling for us - after all, we pay close to 200 euros a night, right? Not to mention, there is no toilet paper and paper towel, no laundry detergent and no dishwashing liquid. We arrived at night and by the time we realized we needed these stuff, the supermarket down the street has closed. 5. Overall, I am still glad that we stayed in arrondisement 14, and rue Dareau is quiet and convenient. However, with so many other choices now in Paris for hotels or apartments, I would not recommend this place. One last thing, if you plan to fit more than 4 adults, look elsewhere; it was cramped enough for us. The owner confirms the availability of a 3G-Key for the internet connection. A second set of latchkeys is available after leaving a deposit of 50. These informations can be found in the field "Extras" under the accommodation description. An additional closet has been set up in the master bedroom with the double bed. Nicely located apartment (close to supermarket and bakery shop and also not far from metro and RER station) and well equiped with all what we needed for our stay. Appartment was clean. Regular contact person was good when she arrived from holiday after 3 days. Appartment was somewhat shabby. Needed paint and plaster work in several rooms. Furniture was basic IKEA. Kitchen table broken. Beds were good. Plentiful hot water and good shower. Kitchen and utensils ...were just adaquet. TV put on by contact person after we had been there 3 days. No telephone service in the appartment. Washing machine broken. Owner contacted us before arrival and warned us of problems - the internet was not working and the washing machine broken. But we only had 2 days of internet in our week and the washing machine was never repaired/replaced. Overall the appartment was oversold on the internet. It needed plastering and painting and looked tired with old IKEA furniture. We would not rent this appartment again nor recommend it, even though it is in an excellent location and a nice building. 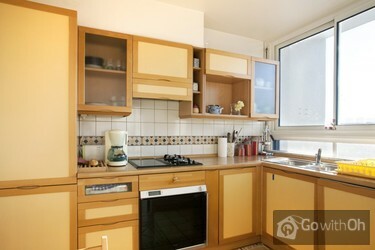 The owner confirms that he has fixed the problems with the kitchen table, washing machine and the internet connection. Excellent flat. Would recommend it and would certainly come back. Owner and keyholder both extremely helpfull. The apartment was very comfortable with shops for basic supplies and restaurants nearby. It was a quiet location - a little out of the way - but we reached all major tourist destinations in Paris easily and cheaply by train. super séjour avec un très bon accueil. et des gens très serviables et sympa. 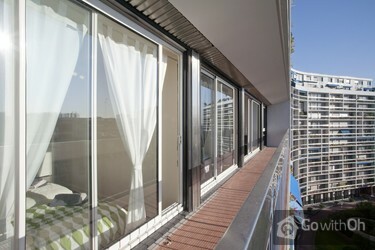 Beautiful flat, very clean, big balcony, great view. For 6 people it may be a little bit too small if you want to stay for a longer period, but for 4 people it's just perfect (we stayed there for 3 weeks with 6 people and it was also okay) The couch is very big and comfortable to sleep on. The ...internet connection and the washing mashine worked without any problems. The area where the flat is located is very beautiful and calm. There are 2 supermarkets directly around the corner, one of them is also opened on sundays. the metro station is also just a fiew minutes of walk away. We were completely satisfied with everything and have nothing to complain about. The contact person is very nice and has always been very helpful. The renter is very nice as well, very reliable and answers to emails very fast. 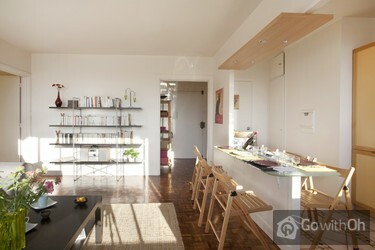 We would like to come back to this apartment for our next stay in paris. Appartement très bien situé avec un niveau de prestation excellent. Equipement parfait pour accueillir une famille de cinq personnes. Quartier agréable ( parc de Montsouris à 5 minutes), avec tous les commerces nécessaires pour le quotidien ( boulangeries, supérettes...). Etant donné que nous avions déjà loué cet appartement l'été dernier (FAVRE Huguette) les demandes formulées (2 clés armoirette dans une des chambres) ont été exécutées. La qualité de la vaisselle et les services de table pourrait être améliorée. Excellent place and clean. I have been very satisfied with this appartment in Paris. Abwicklung und Kontaktaufnahme mit dem Vermieter waren problemlos. Die Wohnung sieht zwar auf den Bildern etwas grösser aus als sie in Wirklichkeit ist, sie hat uns aber vollkommen ausgereicht. Lo único que noté fue que el inodoro que estaba separado del baño y no tenia ventilador de extracción. Y estaría bien si lo tuviera. Aparta de esto todo lo otro muy bien. Bad Points: This is too small for 6 peoples as advertised. It is in a residential area so forgot about it if you have kids. We have people coming from flat below almost everyday to complain about kids walking (I am not saying running), which almost spoilt our holidays. Contact does not speak ...English at all otherwise based on sign language she is really good. Good Point: Very close to train station, supermarket. 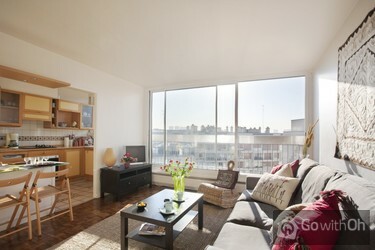 OH have checked the apartment and confirm that is suitable for a stay of up to 6 people. Good value for money ,but could do with a makeover. L'appartamento rispecchia le aspettative; sufficientemente ampio, silenzioso e ben fornito. In cucina pulizia non ottimale (stoviglie, piano, pentole etc.) Nel complesso siamo rimasti soddisfatti. We were very pleased with the accommodation; the cleanliness and facilities were as expected but what really impressed was the amount of sunlight coming into the apartment and the views over the rooftops - a very pleasant place to stay. Recommendations of nearby restaurants provided (on request) by ...the owner proved to be very helpful (and enjoyable). The only factor which let the accommodation down was the lack of any toilet paper and soap which, when you arrive late at night, is not easy to buy locally (and the provision of which, at minor cost, would have greatly improved first impressions). Sehr schöne geräumige Wohnung in guter Lage. Hervorzuheben sind ein sehr netter Kontakt und eine gute Verkehrsanbindung. Wir haben uns sehr wohlgefühlt. The beds were hard and the pillows not at all appropriate. For comfort there should be more than just a two seater sofa and stool. 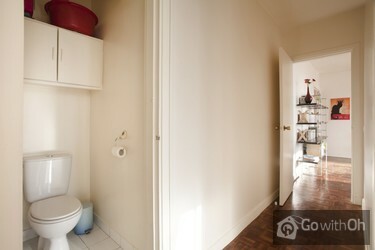 It is also not appropriate for the owner to store their personal items in cupboards. Die Wohnung war sehr schön, sehr sauber und ordentlich, hatte alles, was man braucht. Sie liegt recht zentral und man kommt gut überall hin. Wir haben uns hier sehr wohl gefühlt. Het appartement was heel gezellig, goed geoutilleerd . We voelden ons er erg thuis. Ten opzichte van de metro goed gesitueerd en niet onbelangrijk: goede bakkers in de buurt. Minpuntje was de ontvangst door de zuster van de huismeester die alleen rap Frans sprak. Zij liet ons het appartement keurig ...zien, maar later bleek dat nergens stond waar wij ons afval moesten laten. Op het papier met wetenswaardigheden stond daar ook niets over. Wij hebben de openbare prullenbakken maar gevuld. Over het algemeen een aanrader. Ook qua prijs. M.vr.gr. Petra Snoeker uit Voorschoten. Er was iets mis gegaan met de aanbetaling, maar dat is uiterst snel en correct gecorrigeerd. Zu dritt waren wir sehr gut aufgehoben, herrliche Sonne im März ideal, evt. im Sommer zu heiß? Sehr sauber und sehr freundlicher Empfang. Ich habe aber nicht verstanden, ob es als Hotelappartment oder Privatapp. vermietet wird. Nochmals herzlichen Dank wir hatten 4 tolle Tage. Beim organisieren ...würde ich im nachherein eine Sightseeingtour gleich am ersten Tag nehmen. Wir haben uns durch den Dschungel von Metro und Bus gesucht-sehr stapaziös. Departamento muy equipado, en excelente condiciones y en edificio muy seguro. Ubicación excelente con cercanía a lineas del RER y Metro, supermercado y barrio gastronómico de Rue Daguerre. Departamento muy luminoso y silencioso. Excelente para personas mayores. Muy cómodo para cuatro personas aunque hay capacidad para seis. 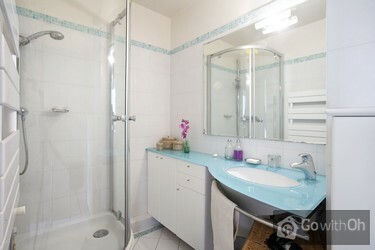 The apartment was clean , bright and airy, the beds comfortable, the bathroom was very clean with a good shower. The kitchen had everything we needed. The welcome was friendly and even though it rained the whole time , we would definetly stay again. Consiglio vivamente questo appartamento qualità prezzo eccellente e rispecchia quello che si vede in foto. Il proprietario molto gentile e organizzato. Da sottolineare la pulizia dell'edificio anche se leggermente datato grazie alla magnifica custode tra l'altro molto disponibile.L'appartamento ...all'ottavo piano è molto carino e ben organizzato... bagno suddiviso in due doccia/lavabo e water ( un pò piccolo), ma di certo ininfluente ( non sono andato a Parigi per stare sulla tazza del water). collegatissimo alla metro a soli 5 minuti a piedi o forse meno anche se Parigi si gira con LA BICICLETTA!!! 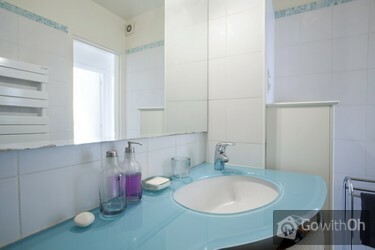 very comfortable appartment, well equiped, clean. the owner does everything that he can to meet his guests needs: umbrellas, rain coats, slippers...we even got champagne. Located close to the Metro, stores, restaurants. T. was very responsive prior and during our stay. The land lady was very nice but spoke very little english, we were still able to communicate. I would like to see a little more seating and bigger TV. The place was clean and well kept. I would ...have like to have paper towels and napkins in the kitchen, other than that the kitchen filled our needs. 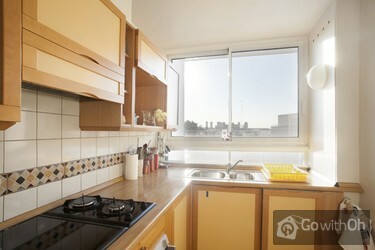 Hemos estado fantásticamente, un apartamento muy completo y bien situado con buena comunicación y barrio tranquilo con buen mercado, supermercados y panaderías proximas. Muy luminoso, cálido y acogedor.La persona que nos dio y recogió las llaves tuvo que soportar nuestra hora intempestiva de ...llegada y salida y fue muy comprensiva. Nos olvidamos una mochila y le pedí al propietario que me enviase las cuatro cosas mas importantes por correo contra rembolso y no tuvo ningún inconveniente y me envió toda la mochila a su cargo.Desde luego que si vuelvo a París no buscaré otro lugar. Diese Wohnung ist für Paris ein Glückstreffer. Sie ist ruhig, sauber und lichtdurchflutet. Ein Lebensmittelgeschäft (Francprix) fast gegenüber, die Metro ist ,wenn man durch den Garten geht, leicht erreichbar. Der 68 er Bus am Denfert Rocherau bringt Sie in 1o Min. ins Quartier Latin. und mitten... in die Stadt. Die Concierge ist hilfsbereit. Grundsätzlich bevorzuge ich in Paris "rive gauche". wodurch meine Entscheidung für da 14. Arrd. gefallen war. Einziger Mangel wäre das etwas alte Besteck, aber nur weil ich auch etwas negatives sagen sollte. Sehr gutes sauberes und gut ausgestattetes Appartment, unkomplizierte Übergabe durch sehr freundliche Hausmeisterin nach zuverlässigem Mailkontakt mit Vermieter. Wir waren sehr zufrieden. Owner was very welcoming and friendly, the apartment was just as advertised, beautiful, and had everything we needed. We'd definitely stay here again. Die Anbindung an den ÖPNV hervorragend: 5 Minuten zur RER-Station(zum Gare du NOrd und zum Flughafen CDG), sehr gutes Wohnviertel. Hübsche, nett eingerichtete Wohnung. Leider gab es kein Toilettenpapier, kein Filterpapier für die KAffeemaschine und auf der Waschmaschine stand eine große ...Schüssel mit feuchten, wohl gewaschenen Handtüchern.Im Bad war eine Halogenbirne defekt, aber es war insgesamt die Lampe, die erneuerungsbedürftig war. Die Töpfe in der Küche waren in beklagenswertem Zustand, vom Herd funktionierten nur die beiden Gasbrenner, die Induktionsplatten gar nicht.Da wir übers Wochenende dort waren, haben wir kaum die Kontaktperson gesehen, sie hatte nach der kurzen Einführung über Sonnabend und Sonntag frei.Ansonsten haben wir uns aber sehr wohl gefühlt . Der Besitzer der Wohnung war sehr nett und zuvorkommend und hätte ein "sehr gut" verdient. Da die Schlüsselübergabe allerdings von jemand anderem ausgeführt wurde, der kein Wort Englisch/Deutsch konnte, war es sehr schwer sich zu verständigen. Die Lage sehr gut, man geht 5 Minuten zur Metro und... 2-3 zum nächsten Supermarkt. Das Apartment ansich war sehr schön. Es waren viele Küchenutensilien vorhanden, sodass Kochen sehr gut möglich war. Ich war letztes Jahr schon in dieser Wohnung und bin nach wie vor zufrieden. Auch für nächstes Jahr würde ich die Wohnung wieder buchen! Die Wohnung hat uns sehr gut gefallen. Es verlief alles nach Plan.